“When I was a kid I got sick a lot. My mom used to say I got sick every Monday and Thursday as a joke. Sore throats were a big one for me. So it’s no small thing that – given how busy my lifestyle is, with a ton of travel each month – that I get sick with a cold or sore throat less than once every couple of years. You know how travel is – between people coughing and sneezing on airplanes and eating out, to having your inner clock disrupted from staying up later or being on a different time zone – it can really throw your immune system off so that the souvenir you bring home is feeling crappy. You come home feeling tired, fighting something off, or you get full-on sick.” My secrets to staying well when I travel are similar to the secrets that allowed me to stop getting sick every Monday and Thursday – and this is super important to my well-being because I’m on the road at least 4 days every month, staying in hotels and meeting with a lot of people. 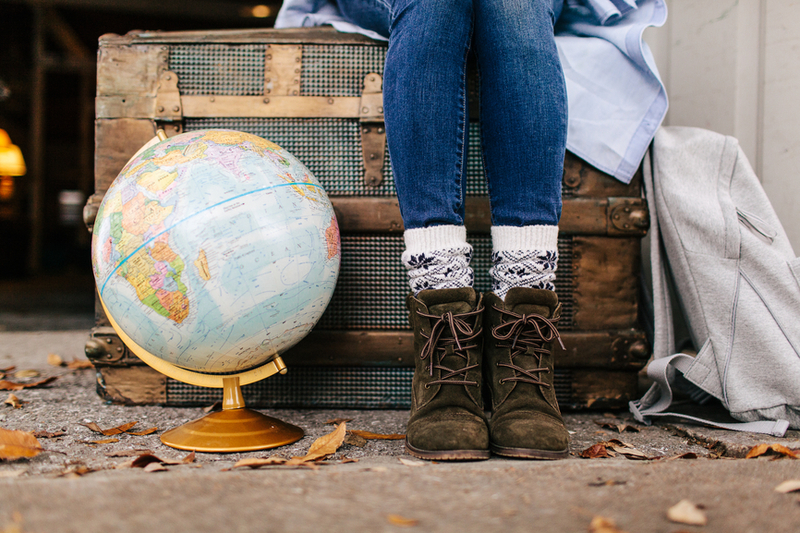 I know if these travel tips will help you stay well, too, so that you don’t need a vacation from your vacation when you get home! Keep an emergency snack stash with me that contains nuts, organic meat jerky, dried fruit, and some 72% dark chocolate. All of these store well, provide a high level of energy, and are better options than a muffin, candy bar, or the usual fare one might turn to in desperation. Follow the 95/5 rule. That said, it is really nice to enjoy a dessert at a great restaurant or something special while you’re traveling. Keep it to 5% of your total food intake for that day (or week), and avoid foods that are big triggers for you. (i.e., If you don’t tolerate dairy, don’t make your 5% splurge an ice cream sundae!) Also keep in mind that sugar immediately inhibits immune function, which can then stay suppressed for hours, making you more susceptible to picking up bugs while you travel. Scope out the scene ahead of time. Before you head to your destination, look online for the healthiest food places in town so you know where to go to get the foods that are going to keep your immune system, digestion, mind, and mood at their best. The canned, freezing air in planes, hotels, and restaurants can dry out the sensitive mucous membranes in your mouth, nose, and throat, making you more susceptible to viruses, while dehydrated cells can make your immune system sing the blues and your blood actually be more susceptible to unhealthy clotting and inflammation. Therefore, pay special attention to drinking ample water (plain, sparkling, or with lemon) throughout the day. While it may be inconvenient to carry your own glass water bottle wherever you go, there are many options (such as lightweight stainless steel canteens, or this collapsible water bottle) – and carrying your own water will make you more likely to drink it. Oh, and of course, if you’re traveling to places where water potability is questionable, drink (and brush your teeth) with water only from “boteas de agua” or boiled water, and avoid other common sources of food-borne infection, including fresh fruit that’s been washed in non-potable water. Hugs rarely pass along bugs, but handshakes are a major vector for spreading viruses and bacteria. Try to hug or do the European side-cheek kiss with friends and colleagues. While you don’t need to go all Howard Hughes about handwashing, since handshakes (and touching railings, door knobs, and other fomite vectors) are inevitable, make sure you wash your hands (plain soap and water will do) before meals, and try to not have your own hands all up in your face – which spreads those viruses and other critters to your eyes, nose, and mouth, where they get a foothold that can cause a cold. Alcohol suppresses your immune system. ‘Nuff said. So stick with water, keep it to one drink and not every day, and avoid mixed drinks that are loaded with sugar. If you are gluten-free, Tito’s Organic Vodka with a splash of pomegranate or cranberry juice in sparkling water is a good juice, or a high antioxidant choice is 4 oz. of cabernet. I also avoid the help of caffeine (beyond what I might have, for example, as a breakfast beverage) because it ends up pushing me past my natural energy limits and adds to, not prevents, the jet lag. Coffee is also dehydrating, which adds to fatigue. In fact, water is a surprisingly good for an energy pick-me-up. Zinc: 30 mg/day (take with food to avoid nausea). Echinacea: 500 mg three times daily (or 3-5 mL of tincture in water twice daily). A gentle adaptogen blend containing Ashwagandha, Holy Basil, and Eleuthero, plus the medicinal mushrooms above, which are also adaptogens. A probiotic containing Lactobacillus and Bifidobacterium strains, daily. If you tend to get cold sores from travel stress, make sure to bone up on L-lysine: 1,500 mg/day for a few days before and while you travel, and take medicinal mushrooms as directed above. If you’re bringing tinctures with you, be sure that you don’t exceed the 3 oz. limit per bottle so you don’t have your herbs confiscated before you get on the plane! Constipation is super common for travelers. Not “taking the trash out” every day can backfire into feeling bloated and uncomfortable, and it can also impact your immunity. Make sure that you make time to go to the bathroom each day and get a lot of fiber in your diet. If you do tend to get blocked up when you travel, bring magnesium citrate with you and take 800 mg each night before bed for an easier morning BM. If you tend to get blocked up for days when you travel, also bring along an herbal blend that has senna leaf, and take before bed if needed. Yes, red-eyes save you some money, but to me they’re a “pay less now, pay for it later” equation – and I always come out the loser with lost sleep, jet lag, and a stiff neck! I pretty much recommend never taking a red-eye unless you are one of those lucky ladies who can sleep through the night – without having a drink or three first and without a sleeping pill. If you can, all power to you. If you can’t, spend the extra bit of money and use your daytime travel hours to catch up on reading, work, or a movie. I’m so serious about not taking red-eyes that I recently had to pass on an invitation to a personal meeting and photo-op with Prince Charles because the only options were not just one, but two red-eyes to make the trip happen! Sorry, Your Royal Highness. Travel can involve a lot of sitting, so make sure to mix it up with movement. For every 90 minutes you’re sitting on a plane or train, get up and walk around; ditto if you’re in the car – walk after every couple of hours, even if just for a few minutes. Then whenever possible on your travels, walk instead of taking the moving sidewalk at the airport, the taxi, or other vehicle when it’s local enough. Of course, this means also adding a pair of practical shoes into your travel wardrobe – that’s why I have a pair of squishy Merrell sneakers or a pair of Tom’s I can toss into pretty much any bag. One of the shifts I find the most exhausting is when I come home late on a Sunday night only to have to hit the decks the next morning with a full day of work ahead. That’s when my luggage ends up sitting on my bedroom floor for a week waiting to be unpacked, and I end up wanting to sleep until the last minute before getting on the go – which means exercise and breakfast get compromised. And it’s when, before I learned how much of a challenge this was for me, I was most likely to start to feel a cold coming on. Now I book my travel, whether for work or vacation, with a buffer of at least a half day, but ideally a whole day before I have to return to my regular work schedule. I do this by planning to return home on a Saturday instead of Sunday from vacation, giving me a day to unpack, rest, and fill my fridge with great food for the week. If getting home before Sunday evening is impossible, I clear the deck for Monday until 1 p.m. While I now work for myself so this is much easier, even when I was working for someone else, if I took a weekend for a conference for example, I took a half-day of vacation time that next morning – which kept me from having to take time off in the form of sick days! Taking breaks might seem counterintuitive, but this is my top tip for preventing burnout — find out more. Those are my secrets for staying well on the go – and breaking the cycle of needing a vacation from my vacation. I wish for you to stay happy and healthy during your next trip, so if you have a tip for staying well on the go (or have a travel issue I haven’t answered), please share it in the comments below. Thanks for sharing..what about traveller's diarrehea? what do you recommend? Love these tips! And I'm loving the reboot program too! You are awesome!